Say Spaaaahhhh! Master baths have become calming retreats; how to get the look. Slice up the cucumber, steep that herbal tea and infuse your ice water with fresh fruit, because today’s master baths rival the designs of the most luxurious day spas. 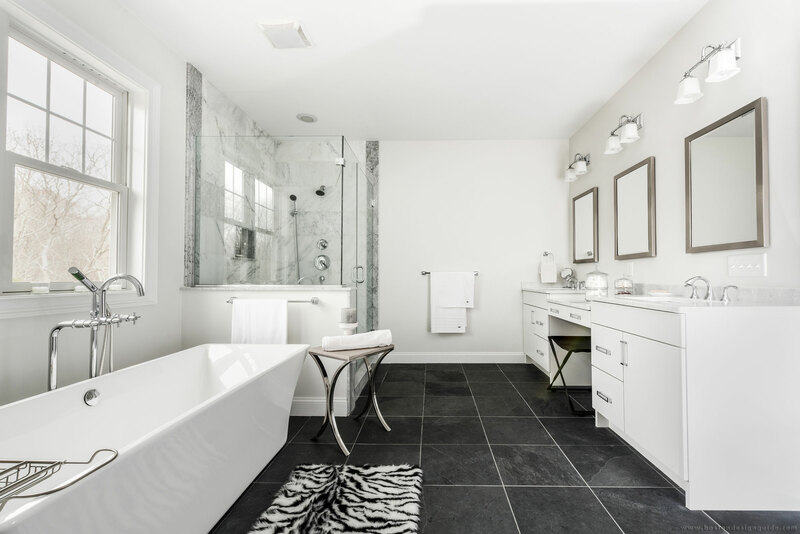 Homeowners and bath professionals are invoking a “serenity now” mentality and crafting calming, clean-lined retreats for bathroom suites. These beautifully conceived private oases are as easy on the eye as they are on the soul. The best part? There’s no appointment necessary. For a master suite in Seekonk, Cypress Design Co. worked with the client to achieve a stunning “escape from the hustle and bustle of everyday life,” offers Showroom Manager Jennifer Voll. 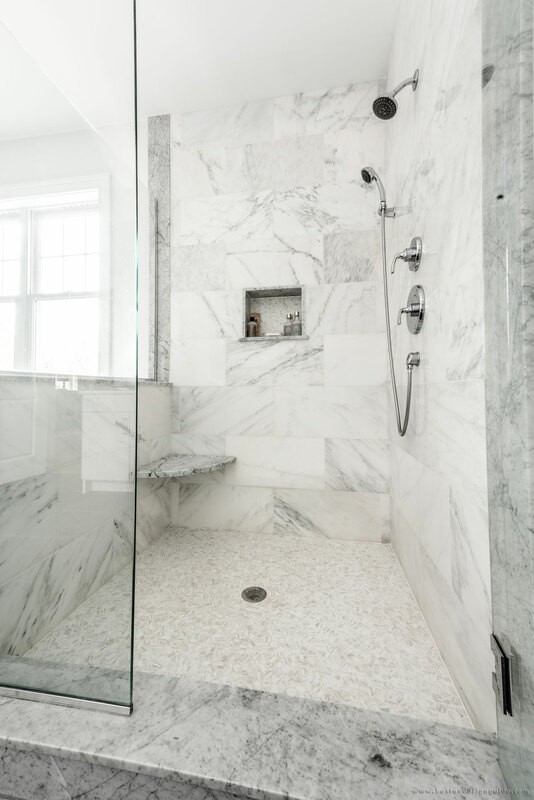 The firm hit the mark and then some with this “cool and modern” design, resplendent with Carrara marble in the shower and countertops and the counterpoint of black slate flooring. This refreshing, minimalist space lets the beauty of the materials shine. 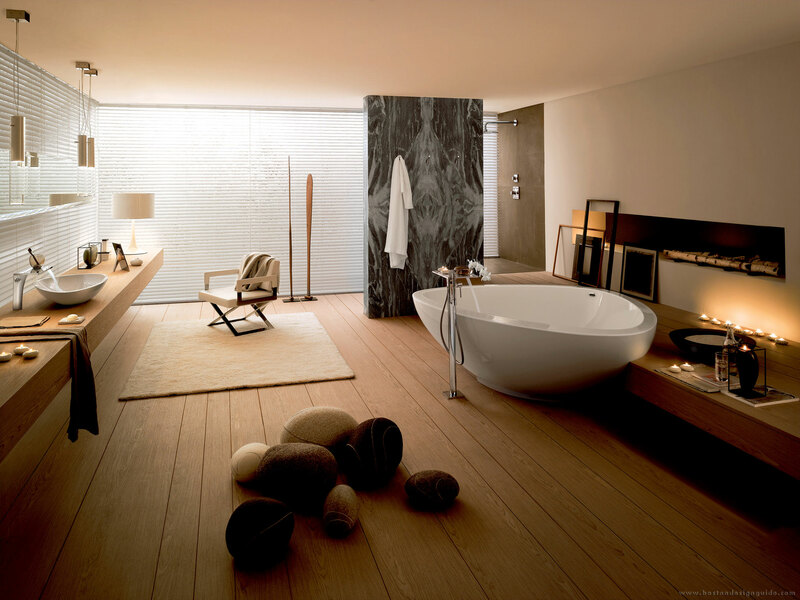 Clutter has no place here, though slender, soigné furnishings and an elegant soaking tub certainly do. Even the white and chrome plumbing fixtures were carefully selected so that there wouldn’t be any “distraction from relaxation,” says Voll. The master bath is imbued with light and boasts an airy feel. In fact, the homeowners, who aren’t in close proximity to their neighbors, declined window treatments to usher in more of that glorious natural light. The choice was in keeping with the less-is-more, breath-of-fresh-air attitude, and Cypress Design Co. was right on board. Scandia Kitchens embraces a similar color scheme, but dons a more traditional style for their master bath, pictured below. Unmistakably classic, this look “will stand the test of time,” says Designer and Showroom Manager Colleen Lord. Don’t let their name fool you, Scandia Kitchens’ high quality, custom cabinetry is equally at home in the bath, where it prizes functionality as well as beauty. 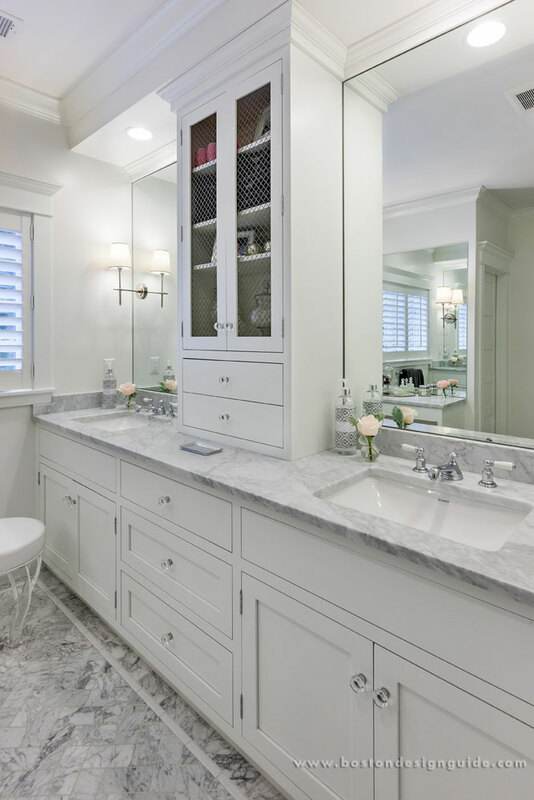 This master combines marble with framed, inset cabinetry for a clean and relaxed feel. Generous storage is the secret to its serenity. Scandia Kitchens’ drawers are outfitted with removable dividers to aid in organization. Lord suggests using one to keep your makeup from mingling with your hair accessories or partitioning the top drawer down the middle so that both “his and her” get prime space by the sink. “Everything has a home,” says Lord. “When you start and end your day” in a space like this, she continues, you’re bound to eliminate stress. 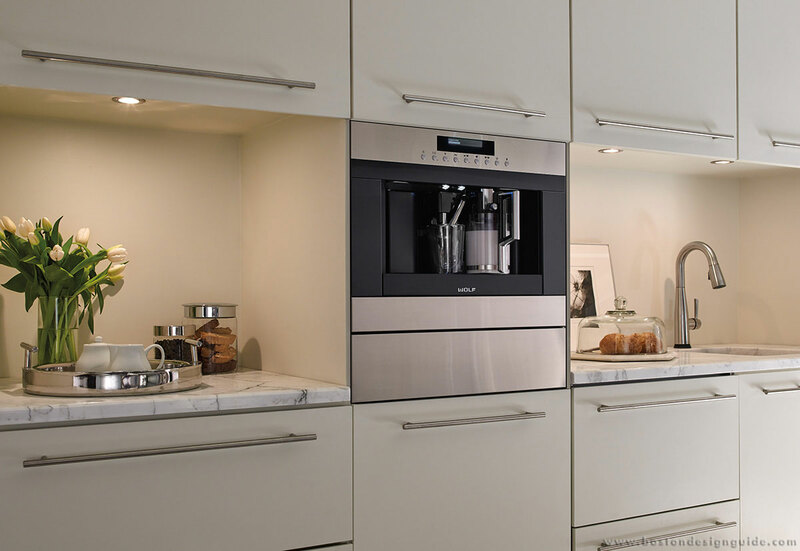 A second design, also by Scandia Kitchens, exemplifies the firm’s artistry in cabinetry. This table-style vanity with stainless steel feet is, at essence, fine furniture, and hand sanded and made to order for this handsome, transitional bath. The espresso walnut cabinetry, smooth against a backdrop of river rock, works beautifully as the centerpiece of this soothing space, which toys with interesting texture, line and tone. 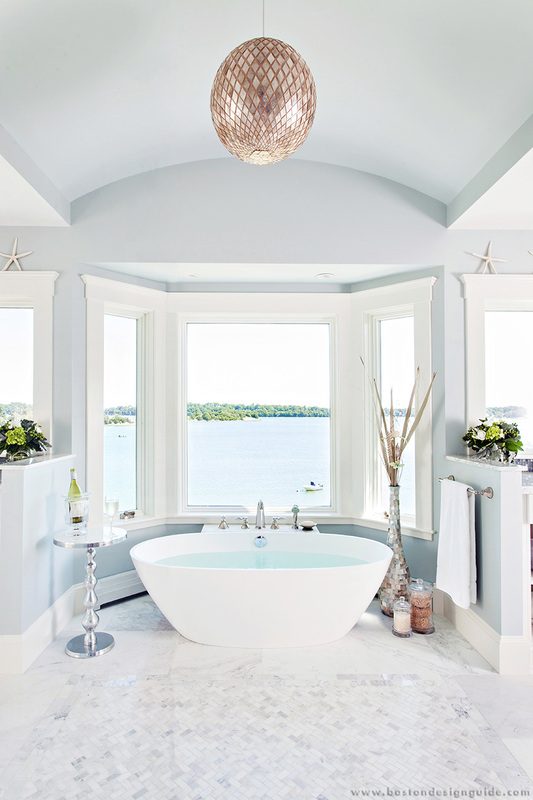 For a traditionally styled two-story home overlooking Hingham Harbor, sweeping coastal views figured heavily into the design of Roomscapes’ sparkling master bath. 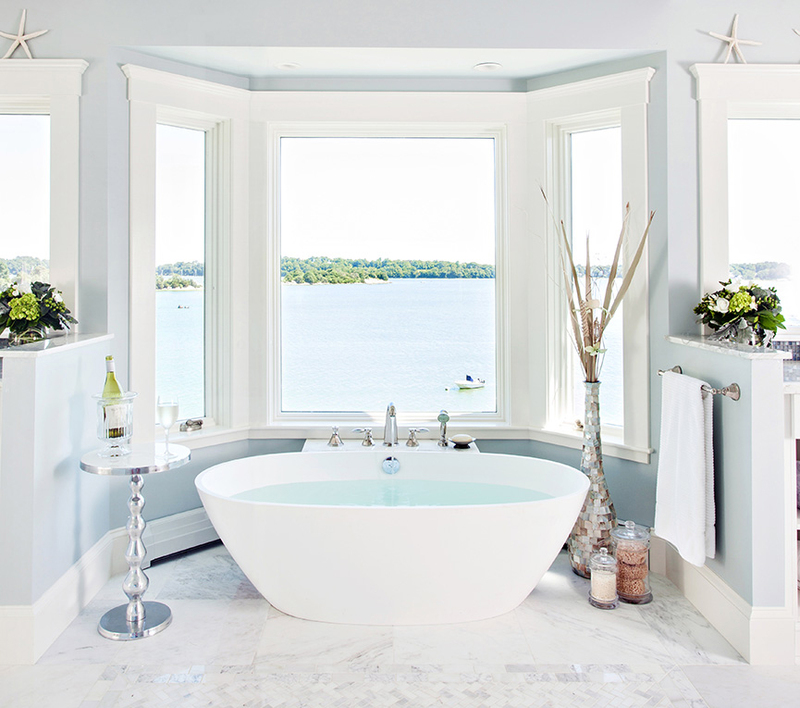 Swathed in soft blues, grays and plenty of white, this immaculate conception has all of the merits of a seaside spa. As the casings of the semicircular picture windows are flush with the rim of the tub’s striking basin, the bather’s gaze rests on the scenic panorama outside. 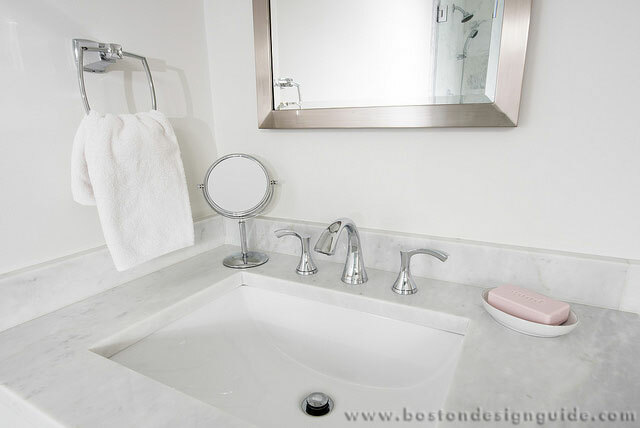 On the other end of the design spectrum, Roomscapes cultivates a stylish, city feel for the master bath of a transitional family home in New Bedford. 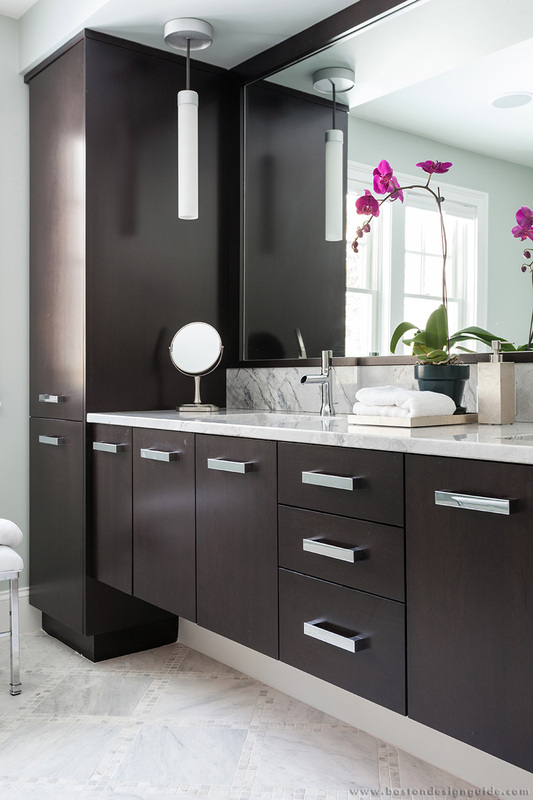 This sleek space is a study in contrasts, with its custom dark stained cabinets and glossy white marble. 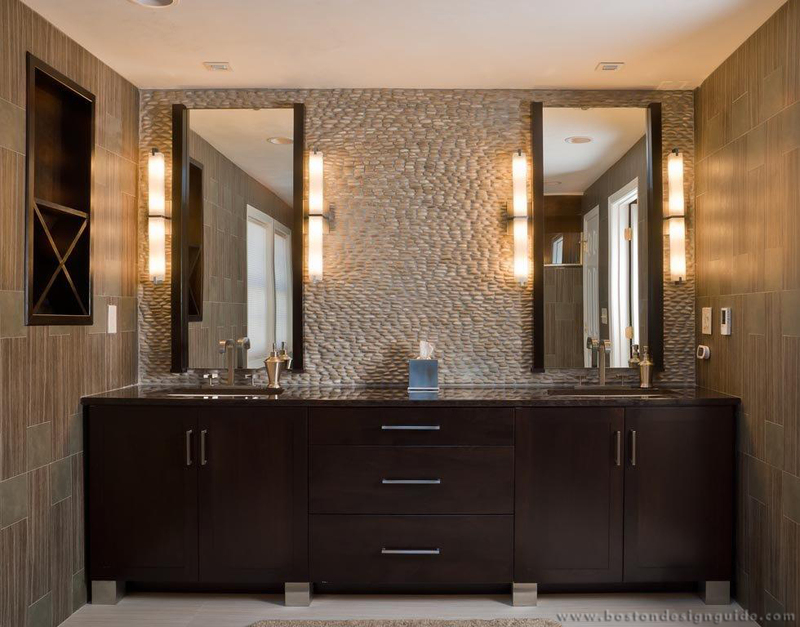 Polished chrome fixtures bring an “edge” to the setting and bring out the exquisite veining of the marble and the subtle geometry of the flooring’s interwoven mosaic pattern. 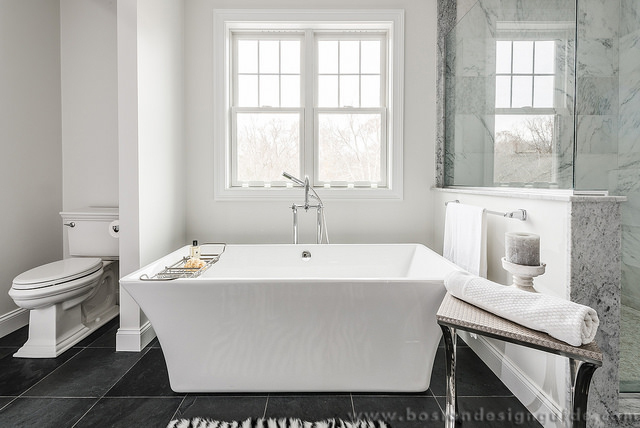 For many New Englanders, a luxurious tub is the heart of a sigh-worthy master bath, and MTI Bath’s award-winning Juliet tub from the Boutique Collection makes this point beautifully. 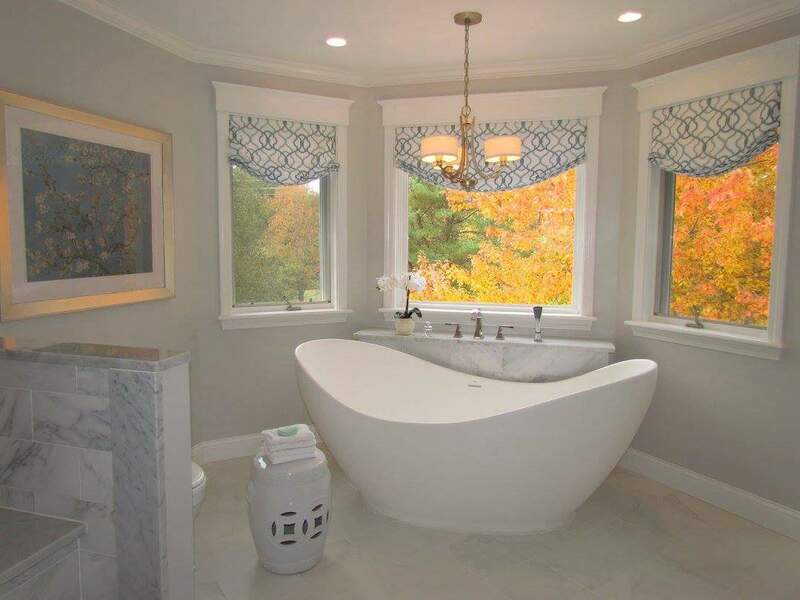 This stunning vessel from Designer Bath and Salem Plumbing Supply cradles its owner with its sculptural design and serves as the focal point of the elegant haven above. Ammara Designs’ Roman tub filler, deck-mounted on marble, a glowing chandelier overhead and treetop vistas complete the inviting scene designed by Chelsi Christensen of Design East Interiors. In an alternative design, the same freestanding soaking tub from Designer Bath and Salem Plumbing Supply is cast in a different light. Designer Lori Scholz of Lori Scholz Interiors plays its stark white hue against deep rich woods for a spare, polished aesthetic. The inclusion of a stunning, statement-making marble fireplace brings the ancient pairing of fire and water to the here and now. 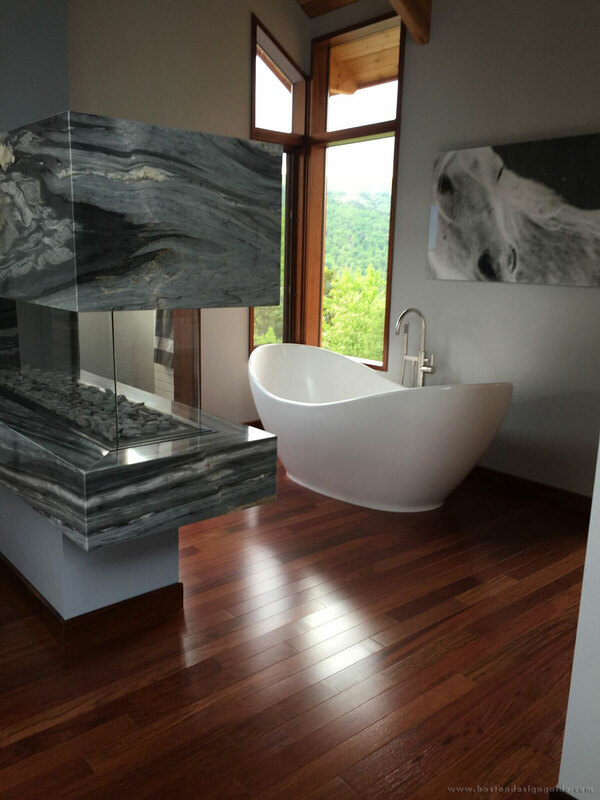 We love the room’s sense of movement and how the fluid contours of the tub are echoed in the stone and artwork. The Dornbracht Tara freestanding tub filler, with its far-reaching contemporary lines and silvery finish, is the optimal accessory. This welcoming bathroom suite by Frank Webb’s Bath Center evokes a similar language of restraint and contemporary style. Approachable yet elegant, this cocoon of a room features products from DXV’s Lyndon Collection, as envisioned by some of the industry’s top designers. The suite of luxury products, fixtures and fittings—the Lyndon freestanding soaking tub in canvas white and the square floor mount tub filler in brushed nickel, among them—prizes symmetry and purity of form. In a second bathroom design, Frank Webb Bath’s Center takes its cue from nature to conjure a Zen-like space of balance and harmony. Replete with barefoot-friendly woods, free-flowing water and elements from Axor’s Massaud Collection (including the freestanding tub, large vessel sink, Downpour showerhead, freestanding tub filler and candle holders), the master bath has an organic appeal. 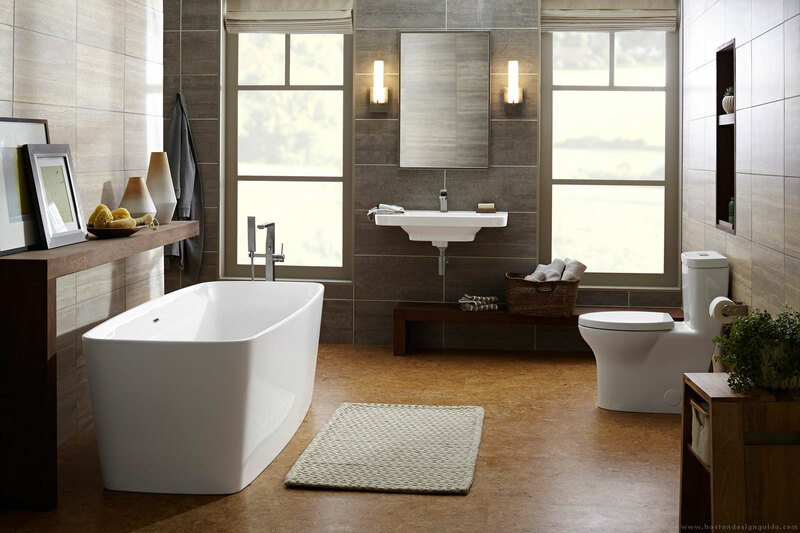 The “calm, feel-good space encourages you to spend time there, even after you bathe,” contends a spokesperson for the reputed distributor and showroom. We’ll say. For Snow and Jones Kitchen and Bath Solutions, the key to a spa-like experience lies in the features of the amenities. 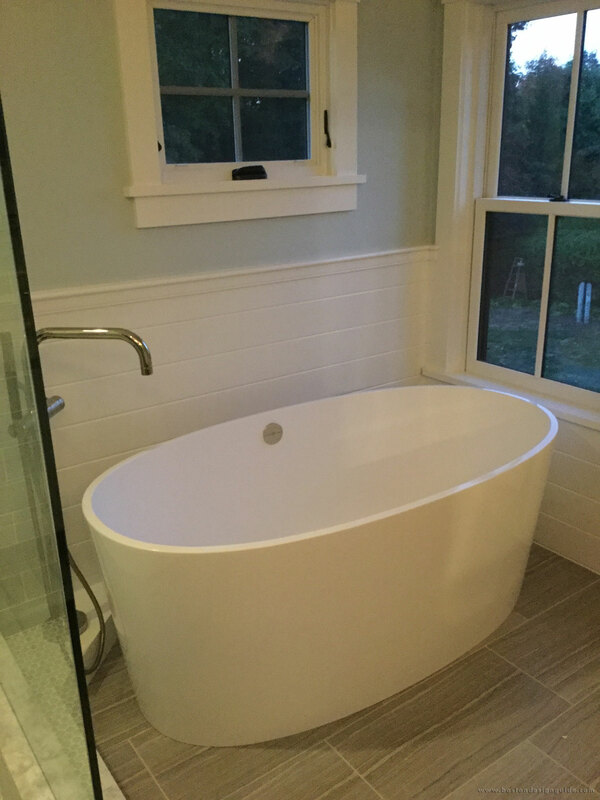 For this bathroom, recently constructed by McKay Construction of Norwell, a freestanding ios soaking tub by Victoria + Albert was selected for its smooth and flawless design. While its footprint isn’t hefty, the bathing beauty has “a deep soak” and a luxuriously “large well for a five-foot tub,” explains Marketing Director and Designer/Builder/ Architect Liaison Danielle Jones. Kohler’s Purist tub filler is the perfect complement, with sleek lines that echo those of the design but don’t overshadow. 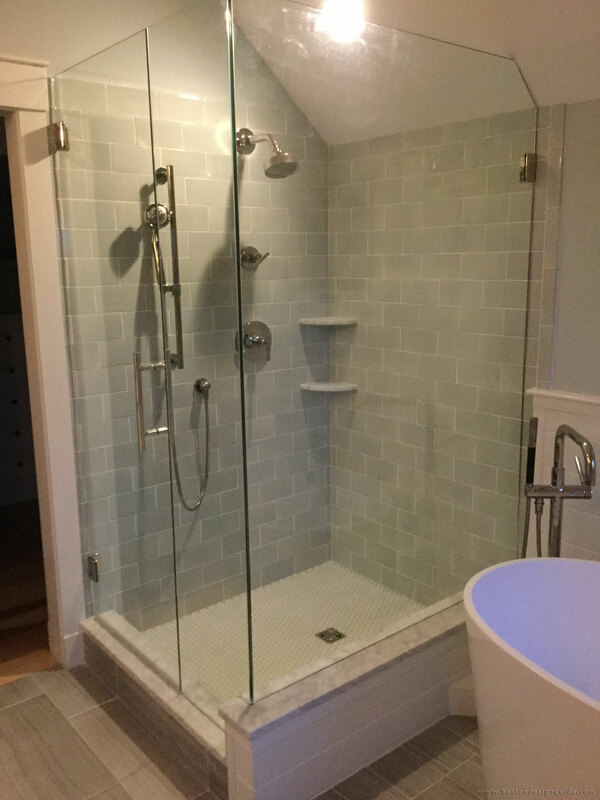 The design’s custom shower, tiled in the cool white and blue palette that pervades the bath, offers a reinvigorating alternative to the soaking tub. The rainmakers’ multifunction sprays not only reinvigorate, they bring the therapeutic benefits of hydrotherapy to its owner on a daily basis. Saunas, too, have become increasingly popular, says Shor. Those seeking the gentle, tension-taming heat of a sauna can work with Splash to outfit and frame a room of their choice. Generally on a lower level (perhaps next to the home gym? ), saunas provide a restorative still retreat, where those waiting to exhale can sweat it out at their leisure. Lest you think that Wolf appliances only graced the kitchen, look what the brand is doing for a magnificent master suite. 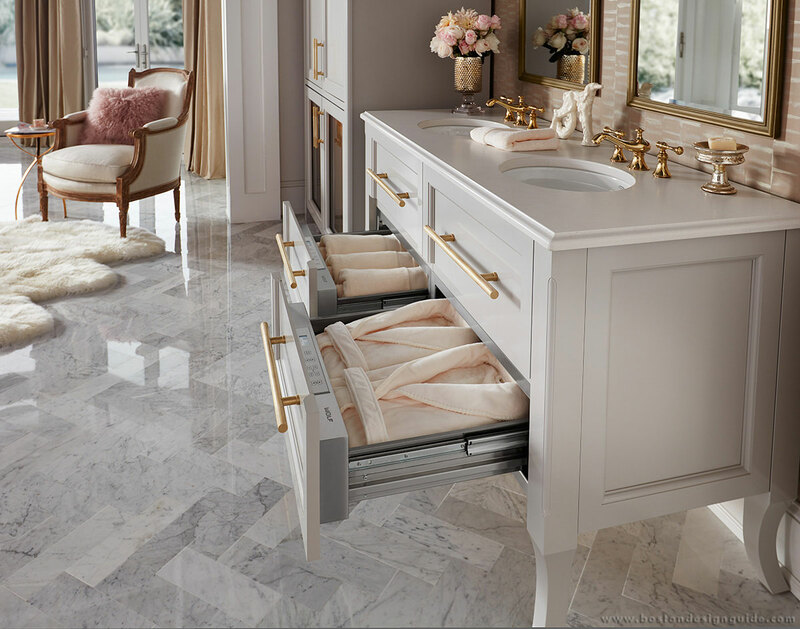 Our sources at Clarke, New England’s Official Sub-Zero & Wolf Showroom, have revealed that Wolf warming drawers are replacing typical vanity storage for decidedly atypical results. 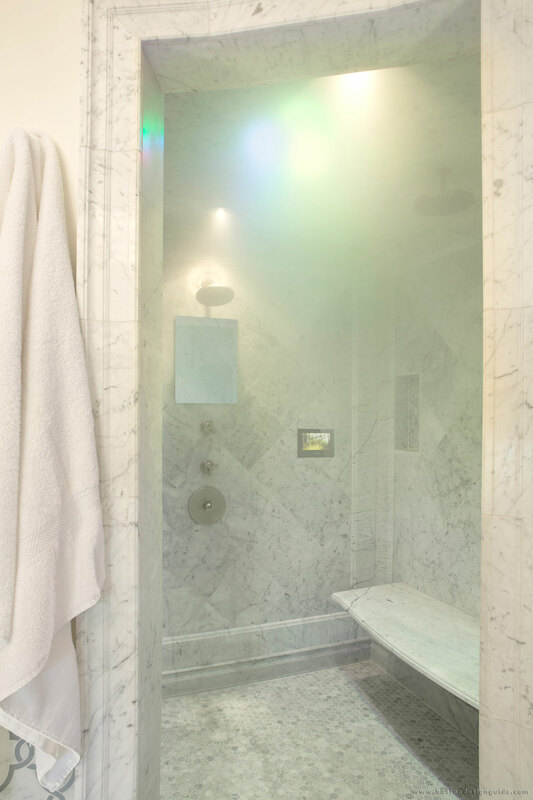 Now, après bath or shower, homeowners can wrap themselves in a toasty towel and robe. 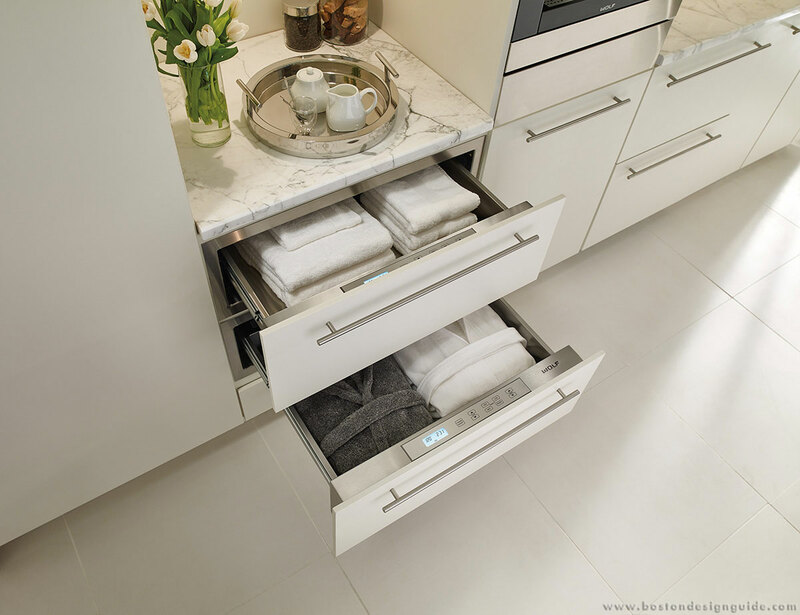 Wolf’s warming drawers can also be programmed to bring those plush towels and terry cloth robes to just the right temperature and take the chill out of the morning. This modern master bath suite features Wolf’s warming drawers alongside a built-in Wolf Coffee System. Now, with the touch of a button, you can enjoy a cappuccino before work, emerging pampered and caffeinated to start your day, or a sip a cup of chamomile as you steep yourself in a luxurious spa bath.